After many months in the non-knitting wilderness, I finally have two things to show. Yarn: Lorna's Laces Honor (sic) in Royal Wedding, just over 2 skeins - I had to wind the third skein for the last six rows of ribbing which was annoying! Mods: I knitted the sleeves in the round. The sleeves were just not going to be long enough so I mirrored the first two sections of the lace chartafter the third section, to avoid having a random lace motif somewhere around the elbow. 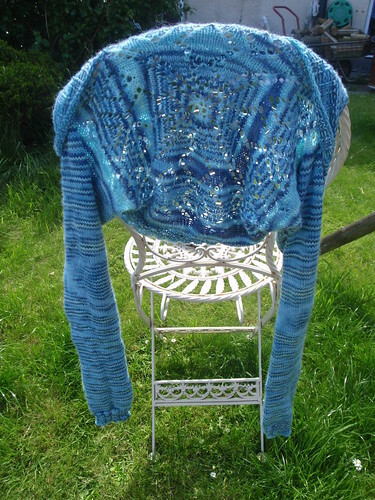 I actually finished knitting this in time for a FO post last week but I didn't get round to photographing it. It should have been a very quick knit. I started it in April and had the back done in four days. 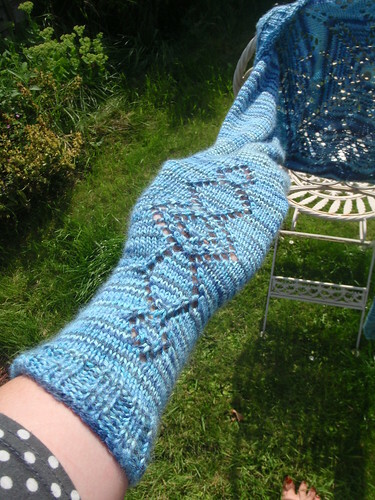 It then took several months to get round to the rest, though the second sleeves and ribbing were done in a weekend. This is truly a lovely thing: soft, amazing colours, very warm. Maybe a little small. I have talked myself into a habit now, where I never knit anything with positive ease: as a chobber, experience tells me fitted clothes are more flattering. So, I went on the size closest to my actual back size. It doesn't have the slouch of the original but I like it nonetheless. I also learned that sometimes designers have it right (shock!) - the sleeves were meant to be knitted flat and sewn up but I thought I knew better. However, sleeves in the round made blocking out the back a bit of a pain. I managed it, though. This was sort of a kit - a gigantic ball of yarn with the pattern on the ballband. I bought it at Get Knitted around Christmas time and promptly forgot about it, which was a great shame because it was so quick. 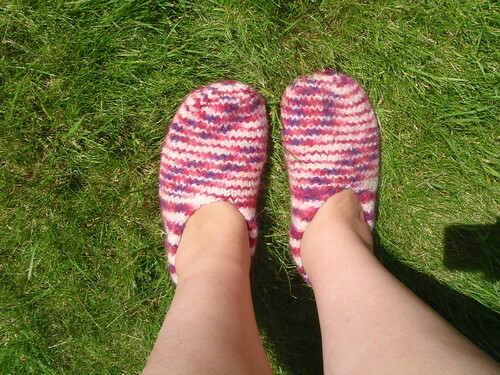 I knitted (on 6mm needles) and felted them over the weekend - a true weekend FO if ever there was one. The wool was the catchily named Schachenmayr nomotta Wash+Filz-it! siriuscolor (Ravelry link) which is currently available at one third off in the Get Knitted sale - so if you're looking for Christmas presents, don't delay!